Considering St. Vincent and The Grenadines vacation? Escape the hectic every day life by visiting one of the most fabulous Caribbean spots out there! From the lush tropical rainforests generously packed with the exciting eco-adventures to the picture-perfect beaches with coral reefs, underwater marine life and the untouched surrounding beauty of nature, the St. Vincent island has got it all! Perfect for yachting, scuba diving, snorkeling and contemplating the spectacular views, St. Vincent has something in store for all. One destination with 32 phenomenal Caribbean islands, you haven't experienced the real heaven on earth until you visit St. Vincent and the Grenadines! Why go on St. Vincent and The Grenadines vacation? Despite being so small in size, St. Vincent and the Grenadines have a turbulent but quite interesting history. Take some of the offered cultural or history tours to see amazing historical landmarks like Fort Charlotte, Old Hegg Turtle Sanctuary, botanical gardens, Wallilabou Anchorage and the Dark View Falls. The islands are packed with the most fun and quite unique things to do that will make your St. Vincent and The Grenadines vacation exciting and definitely will never let you get bored. Diving, snorkeling, exploring the islands by foot or on a bicycle, smelling the sweet scent of tropical flowers and rum punch in the air along the way, will make you want to come back to this paradise again and again. The most mesmerizing, unspoiled and very secluded beaches in the world where you can have it all to yourself make this tropical destination a favourite place to vacation. Water sports lovers will appreciate the most stunning coral reefs, shimmering ocean waves and sleek yachts anchoring their boats at the nearby docks. And no matter which island you visit, there is plenty to see, a ton to do and a lot of elegant lodging to choose from. The St. Vincent and The Grenadines are calling you, pack your suite cases and be on the way to a world of Caribbean aura! December through April is the prime time in St. Vincent and the Grenadines, and even though the weather is gorgeous and rarely humid. The resorts rates are ridiculously high during this time. This is the time when most tourists show up, making the wait times longer and the islands more crowded. To ensure a good spot, you would want to book your St. Vincent and The Grenadines vacation far in advance. May to June is one of the best times to pay a visit to the incredible St. Vincent and the surrounding Grenadines. This period is right in the middle between the hurricane season in the summer and the high season in the winter. Temperatures stay around 25-29 degrees Celsius (77-84 degrees Fahrenheit) without any precipitation as of yet making your St. Vincent and The Grenadines vacation relaxing and pampering. November is another perfect time to come to St. Vincent and the Grenadines. Hurricane season has already passed by then but the massive December crowds have not arrived yet, so your Caribbean getaway will be spend in privacy and pure enjoyment. And although many smaller hotels and resorts give out specials throughout the year, November is the ultimate time to get the best out of local accommodation prices, as the rates significantly go down. Temperatures during this time are hot at 30 degrees Celsius (86 degrees Fahrenheit), but provide light trade winds and an opportunity to get that perfect tan. 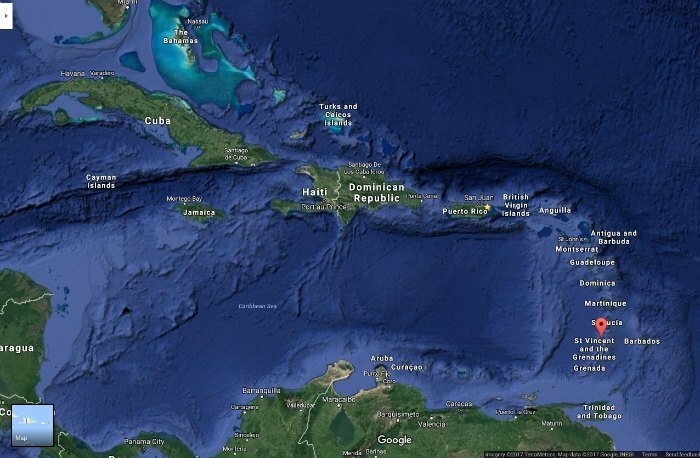 Where are St. Vincent and The Grenadines on the map? St. Vincent and the Grenadines, the islands of fabulous explorations, have the total area of 389 square kilometres. The nation is comprised of 32 smaller islands and hundreds of islets stretching south all the way to Grenada. St. Vincent and the Grenadines are located 136 km (85 miles) northeast of Grenada, 179 km (111 miles) west of Barbados, 76 km (47 miles) south of St. Lucia and 283 km (176 miles) northwest of Trinidad and Tobago. 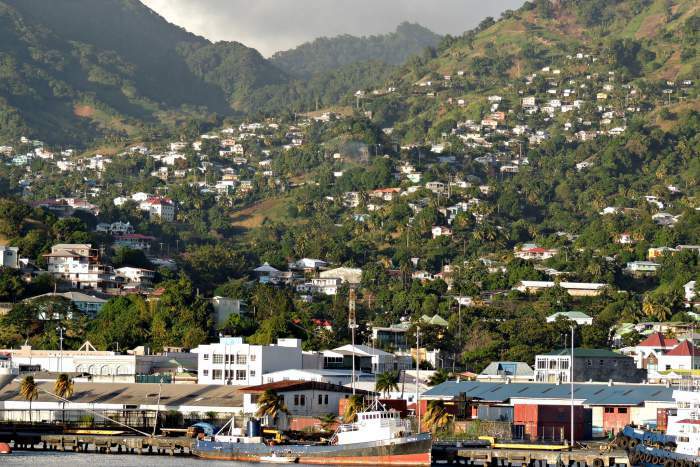 Even though tourism is not as developed here as in neighbouring Caribbean countries, St. Vincent and the Grenadines have the export industry of bananas, dasheen (taro), arrowroot starch and even tennis raquets that successfully get sent overseas. 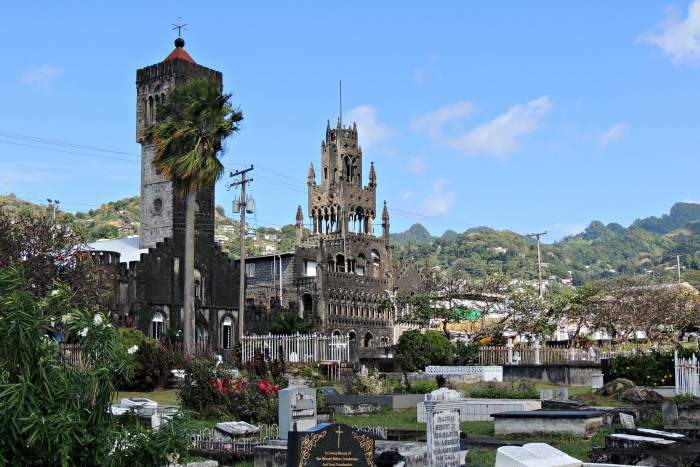 Kingstown, the capital city of St. Vincent and the Grenadines, is a lively town with arches, cobbled streets, historic stone buildings and magnificent Churches you will never spot anywhere else. Explore the beautiful and eye-catching architecture before you head to the Botanical Gardens that is home to hundreds of tropical flowers and aviaries. With the population of around 20,000 residents, Kingstown is the main commercial centre and a port of entry for tourists. Aside from discovering some of the top attractions in Kingstown on land, take some time to discover the marine life the town has to offer. Hiking is one of the best things to do on St. Vincent and The Grenadines vacation around Kingstown as it offers a number of picturesque trails giving you an opportunity to explore the surrounding beauty all on your own. According to statistical records, population in St. Vincent and the Grenadines in 2016 was 109,858 residents. Most of the population on the islands is of African decent, whose ancestors were brought here for the slave trade industry. Other ethnic groups include residents of Carib background, such as immigrants from nearby Caribbean countries and a local American Indian group. Christianity is considered as the predominant religion in St. Vincent and the Grenadines. Other religions are also practiced but are in the form of a minority. Local residents are some of the most friendliest and warm-hearted people in the world. They sure know a word of two about hospitality, so your stay is guaranteed to be special. English is the official language in St. Vincent and the Grenadines and is the language of communication in all educational institutions, government and business operations as well as media. Other dialects such as Vincentian Creole, French Patois, Portuguese, and Bhojpuri are also present here and are usually incorporated into the every day speech between the locals. Although, there are so many dialects, you will not have any problems on your St. Vincent and The Grenadines vacation speaking or understanding a local resident as they beautifully speak the international language. Education in St. Vincent and the Grenadines is free but not compulsory, with the literacy rate at almost 90%! Government-run schools are free of charge, others charge yearly tuition fees. Many local students that want to pursue a higher education, go on to study abroad, some stay behind to get their education in St. Vincent's technical college or teacher training college, others end up working in the islands' tourism industry. Argyle International Airport in St. Vincent is the main airport that serves all international flights as well as flights to and from other Caribbean destinations. This is brand new and a quite large facility serving domestic and international flights. Argyle International Airport was designed to accept the largest aircrafts and welcomes flights from Canada, United States, Europe, South America and the Caribbean. There are no non-stop flights offered from Canada, United States or Europe, but north American and European passengers have an option of getting on St. Vincent and The Grenadines vacation via major Caribbean getaways such as Barbados, Grenada, Trinidad, Puerto Rico, Martinique and St. Lucia. These Caribbean islands also offer flights to St. Vincent and The Grenadines' smaller islands like Union Island, Canouan, Mustique and Bequia. Direct flights are also available from some of the major cities in the United States such as New York, Washington, Dallas and Phoenix. Passengers coming from Canada or the United Kingdom, will need to fly to one of the US cities and take a connecting flight to one of the Caribbean counties. Please keep in mind that you might have to make a layover in one of the countries, so account for that when booking your St. Vincent and The Grenadines vacation. Some of the other islands in the Grenadines have their own, quite small but fully operational airports. Canouan, Bequia, Mustique and Union Island's airports all service daily flights to and from St. Vincent. So if your final destination is one of these Caribbean hot spots, you will need to fly to St. Vincent first and take a domestic flight to your island of choice from there. You may also travel to either islands by an inter-island ferry that leaves from the main harbour in St. Vincent. Ferry service is offered by a number of companies daily, but their schedules vary so it's best to check them in advance. Some companies also provide water-taxi service, but it is not a very popular means of transportation in St. Vincent, so it's best to inquire about it before travelling to the dock. The selection of lodging when visiting St. Vincent and the Grenadines is endless as all 9 most traveled islands offer the best resorts, inns, hotels, guesthouses and villas for rent. They are all filled with cool things to do, mouth-watering cuisine and warm and friendly service that you will definitely appreciate. Hotels and inns on St. Vincent are all small but very cozy. You won't find a lot of luxury and glitzy lodging here, but the ones that are offered will give you a truly remarkable experience at a pretty affordable price. Private villas are also offered for rent, giving guests the seclusion they long for. St. Vincent is a more quieter island; therefore, the selection of accommodation options are narrow. This is when you travel to the Grenadines the world of luxury and variety in lodging opens up. 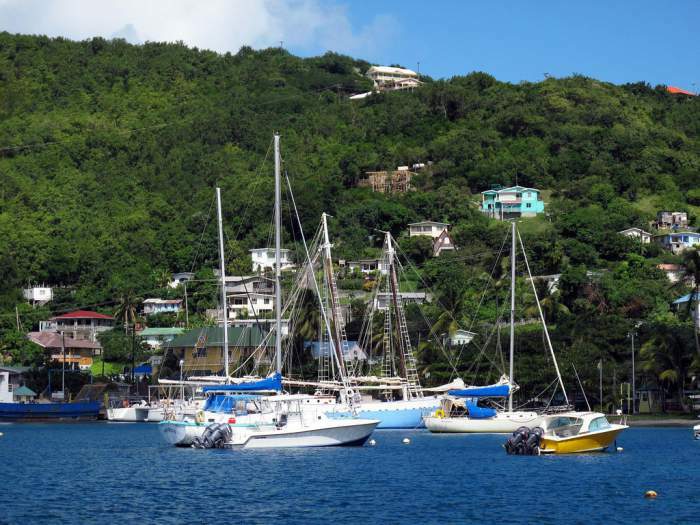 Bequia, that is located south of St. Vincent is a popular St. Vincent and The Grenadines vacation destination that offers various inns, guesthouses and boutique hotels that are packed with exciting excursions and activities. Here you will also have an opportunity to rent out a villa with great amenities around. Mustique is a very exclusive private island that offers the visitors the most luxurious selection of tucked into lush hillsides villas. You will not see a lot of tourism here, because Mustique appeals for its' natural beauty and privacy all in one. If you are looking for seclusion in a form of a resort, the option is there as well. Canouan, a very quiet and unspoiled island, plays a very important role as a busy venue for chartered yachts. Accommodations here include villas and one boutique luxury hotel that is located in the local gorgeous tranquil oasis - Tamarind Beach Hotel & Yacht Club. Petit St. Vincent is another private resort island. Accommodations here are limited to a few vacation rentals and only one high-end resort, called, not surprisingly, Petit St. Vincent Resort. You may spend your entire St. Vincent and The Grenadines vacation here totally uninterrupted. It is a perfect getaway spot for someone who is really escaping the busy every day life and wants a lot of privacy. Union Island is famous for its dramatic landscapes and panoramic vistas that you can contemplate for hours at a time. This spot is mostly visited by yacht dive operators that serve sailors and scuba divers; therefore, only a few guesthouses and small hotels are available for renting. This island's relaxed and casual accommodations offer friendly service, delicious food and the perfect location to visit other surrounding islands. Just 2 miles from Union Island, lies a luxuriously gorgeous Palm Island with Palm Island Resort & Spa. Here be ready to be carried away by the never-ending white sand beaches, glorious sunsets and a vibe you will never forget after your St. Vincent and The Grenadines vacation. A small island of Mayreau has one of the most mesmerizing beaches in the Grenadines. It is so quiet that you might wonder if you are all alone here. This island does not have much, a tiny village, one road and a small inn, but that's the whole beauty of Mayreau to stay uninterrupted. Young Island, a mysteriously stunning getaway spot, is a private island that is located off the coast of the country's capital Kingstown. It offers pampered luxury in its hotels and easy access to many St. Vincent attractions. No matter which island you choose to stay on your St. Vincent and the Grenadines vacation, you will find the best accommodations that will suit your needs, preferences and most importantly your budget at their best! Weather in St. Vincent and the Grenadines stays relatively the same throughout the year with a difference of a few degrees. Normally the temperatures are in the comfortable high 20s degrees Celsius (80s degrees Fahrenheit) but these numbers may slightly vary in winter and summer months. December through April is the high season for St. Vincent and The Grenadines vacation, and the weather stays at 25-27 degrees Celsius (77-80 degrees Fahrenheit), making it a more comfortable period with less humidity and pleasant trade winds. Summer months that begin in May and last through October have temperatures around 30 degrees Celsius (86 degrees Fahrenheit), and unless on rare occasions will never fall lower than 23 degrees Celsius (73 degrees Fahrenheit), even during the nights. Expect to see some heavy rainfall from July to November. A lot of Caribbean countries have a wet and dry season; however, St. Vincent is just wet and hot all year around, making summer time slightly wetter and warmer than the winter season. Sea temperatures in the summer go up to 26 degrees Celsius (78 degrees Fahrenheit) whereas in the slightly cooler winter months the water is warm at 24 degrees Celsius (75 degrees Fahrenheit). The islands are located within the hurricane zone so if you are planning your St. Vincent and The Grenadines vacation anywhere from June to November, keep in mind that there is a high chance of a tropical storm. Public transportation is offered in St. Vincent and the Grenadines and is a very popular means of getting around on a budget. Most buses are mini vans and can be hailed down along main streets in the city. A conductor normally travels with the bus driver to assign seats and handle the cash. There are buses available in St. Vincent, Bequia and Union Island; however, depending on the time of the day, the buses can be overcrowded, cramped full and may travel at a low speed due to very poor road conditions. In that case you would want to consider hiring a taxi if you want to travel in comfort and/or are short on time during your St. Vincent and The Grenadines vacation. Taxis are a safe way to move around the St. Vincent and the populated Grenadines islands if renting a car was not in your plans nor budget. Taxi cars are not metered, so you would need to settle on the price prior to boarding the vehicle. Taxis are available practically everywhere. You can spot them at the airports, along the streets or simply order one from your hotel's front desk. Some resorts and hotels provide transfers from and to the airport, others do not. Either way you will not have a problem of flagging down a taxi. Their service is prompt, their fares are reasonable especially for short trips and they will gladly take you from one place to the other in no time. A ferry is an efficient and relatively inexpensive way to do your island hopping on your St. Vincent and the Grenadines vacation. A central harbour in Kingston offers numerous ferry companies that shuttle their passengers between st. Vincent and other Grenadine islands daily. The fastest ferry travels from St. Vincent to Union making stops in Bequia and Canouan (and if requested in Mayreau); however, those trips are not done every day. The ferry companies have their own schedules, some of them make their trips on a daily basis, some on certain days of the week. Inquire about their timetables in advance so you plan your St. Vincent and the Grenadines vacation accordingly. Driving in St. Vincent and the Grenadines is on the left and if you are entering a blind curve or a steep hill, always honk so the other drivers know someone is approaching. There are a few car-rental agencies on the islands, but in order to operate a vehicle you will need either an international driving licence or a local temporary driving permit that costs around $25 (US). You must be at least 17 years of age to be able to drive a car on the islands, and if you are renting one, you must be at least 21 years old. If you are less than 25 years old, certain fees will be applied. 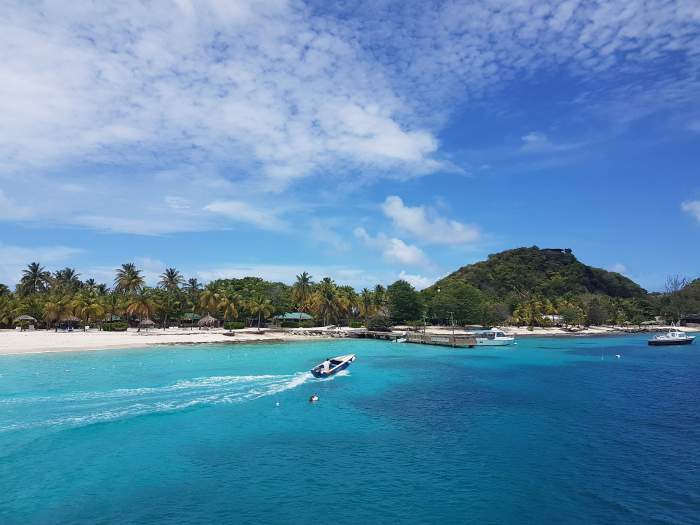 Car travel is a popular way to explore the islands on St. Vincent and The Grenadines vacation, especially if you are planning on extensive driving. If not, taxis and buses are always readily available to provide their inexpensive service. The speed limit in town and all populated areas is 32 km/h (20 m/h); however, on open roads the speed digits vary. Generally, parking is widely available on St. Vincent and the Grenadines, it is free and is easy to locate. Only when you get close to tourist attractions and main streets in the city, the enterprising locals charge for parking in such areas. Most roads in St. Vincent and the Grenadines are narrow making it very difficult for two cars to pass. When driving on your St. Vincent and The Grenadines vacation, keep an eye out for many things including schoolchildren, dogs, chickens and goats that also share the road constantly with vans, trucks and cars. Normally, if you are driving within the populated areas, the roads are in fair condition with less bumps and curves, but things dramatically change once you leave the city. The roads in the countryside are tricky to navigate and are bumpy with numerous potholes, so make sure your car rental has a spare tire and the accompanying equipment to change it if needed. Motorcycles are also available for rent and even though St. Vincent and the Grenadines are among the few islands you really want to explore on your own, the roads are very narrow, bumpy with sudden turns, making it hard to do your exploration at the speed of a motorcycle. In that case, we would suggest opting out to rent a car. Eastern Caribbean Dollar is the official currency in St. Vincent and the Grenadines. American dollars as well as all major credit cards are welcomed practically everywhere; however, US coins are not accepted. If you decide to pay your way through with US currency, keep in mind that the change will be given to you in Eastern Caribbean Dollars. Hotels, most restaurants and local shops as well as car-rental agencies all accept major credit and debit cards and even traveller's cheques. Tourists are advised to make all of their traveller's cheques in US dollars. There are not that many ATM machines, but you can easily spot them at one of the local bank branches or at the airports. To avoid trips to the bank each time you need cash, it is recommended to bring cash money with you on St. Vincent and the Grenadines vacation. This will save you both, time and bank withdrawal fees if there is any. Most of the time, the hotels, restaurants, cafes and other dining establishments will add a service charge of 10% to their final invoices; however, if you cannot spot such a charge on your bill, a tip at the same rate is considered appropriate. If your server went out of his way and provided a top notch service to you, extra cash given directly to the server will always be appreciated. Patons renting out a villa for St. Vincent and The Grenadines vacation will need to budget a few extra dollars for the housekeeping staff. Depending on the amount of guests staying, the gratuity can be as much as 10%-25% per day depending on the tasks performed and the level of service received. This amount is normally shared between all of the guests. A generous tip is always encouraged and builds mutual appreciation between you and your service staff from day one. Bellmen and porters get $1 per each bag they assist you with, while the housekeeping staff at the resorts and hotels receives $2 per day for their services. Aside from driving a taxi, taxi drivers may provide tour guide services to their clients. The ongoing rate for gratuity for such is 10% of the total fare. Vendors in St. Vincent and the Grenadines are friendly and never pushy. If you are enjoying your time on the beach, chances that someone will stalk you with their products are slim. If you are offered a thing or two and not interested in purchasing anything, simply say "No thank You" and the vendor will be on his way. Vendors that have their huts and stalls opened on the streets and local markets are super friendly and always take their time explaining about their merchandise or answer any questions you might have about a specific product. They are never bothersome as they respect the tourist's space and their importance in the islands' tourism industry. They really do want to make the visitors to the island happy and satisfied with their St. Vincent and the Grenadines vacation. Camouflage clothing is strictly prohibited on the islands as police attire features camouflage print. If you are spotted wearing anything of a camouflage pattern there will be serious consequences and fines. This is against the law, so leave all of your belongings that feature camouflage at home. Leave all of your belongings in a hotel safe or even at home before travelling on St. Vincent and the Grenadines vacation. Petty crime is common among those that live in St. Vincent and those that visit, so do not leave your personal property unattended unless you are ready to say goodbye to them. Chances of them being where you left them are zero, so act accordingly. Do not walk alone at night as you might be a target of crime. Always keep an eye on your surroundings and if you happen to leave the resort, try to take a friend or a companion with you. Manchineel trees are a real danger, and if touched you will get some seriously excruciating blisters all over your body. These trees with apple-like fruits are extremely poisonous. So if you need to seek shelter or get into the shade, avoid them at all costs and find shelter elsewhere. When you go to the beach, keep in mind there are no lifeguards on duty in St. Vincent and the Grenadines so swim with caution. Always keep a bottle of cold water with you as well as sunscreen to avoid dehydration and sunburns, that can even ruin your vacation. Mosquitoes and sand flies can be irritating so bug repellent is a great idea to keep them away. When you go on St. Vincent and the Grenadines vacation keep in mind that it's best to drink bottled water while on the islands. Although tap water is still potable, more on St. Vincent than on the Grenadines, an upset stomach has been reported among some visitors. So if your body is not immune to change in climate, food and water, stick to the bottled product that can easily be purchased in superstores in the area. Electric current in St. Vincent and The Grenadines is usually 220-240 volts with 50 cycles; however, some smaller and older resorts and hotels might use US style outlets with 110-120V power and 60 cycles. If you are coming anywhere from North America and staying at one of the older resorts, you will not need any adapters or converters. Bring the electrical devices and chargers only. Patrons coming from North America on St. Vincent and The Grenadines vacation with multi-voltage appliances such as laptops, tablets etc. and staying at the resorts with local 220-240 voltage will require a plug adaptor. Hair dryers, curling irons, electrical shavers etc. will need a travel adaptor and a step-down transformer as well in order to work on the island properly. Some high-end villas in St. Vincent run both, the UK and North American voltage systems, so you might not need transformers/adaptors during your vacation. Inquire about your accommodation's voltage by either sending them, e-mail, direct calling them or simply speaking to your travel agent. That way you will not have to pack unnecessary things with you on your St. Vincent and The Grenadines vacation.